NATURAL ECO-FRIENDLY MATERIAL. Made from the premium quality material, highly flexible and durable, withstand a lot of wear without damage. 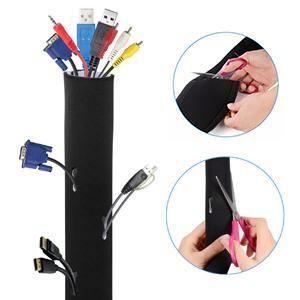 NEAT AND TIDY: AGPTEK cable management is a simple and convenient solution for managing you cables, making all the cables wrapped up and hidden in one sleeve,no more tangled cables or any mess. A little change makes your life different. By holding this belief, Linking Port engages in providing products that can help people to live a more at-ease life. Cooperating with excellent manufacturers, Linking Port keeps helping to design and produce high quality home improvement products for buyers. Cable management products is Linking Port’s another trying. 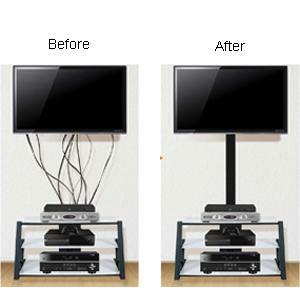 To manage messy cables behind your TV, computer, home theater, game consoles and so on. which can stand up to plenty of wear and tear without being damaged and allow for multiple cables and flexibility. then fold it around the wires and seal the stong hook & loop. 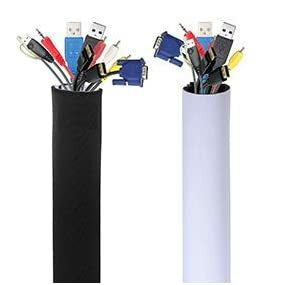 The diameter of the sleeve is about 1.5 inches when sealed, which allows you to put up to 10 cables inside the sleeve. Black/white reversible colors fit seamlessly and perfect for home or office use. Available to be cut to the length you need by the scissors not leaving frayed edges. Black/white reversible fits seamlessly, make a choice according to its application background. 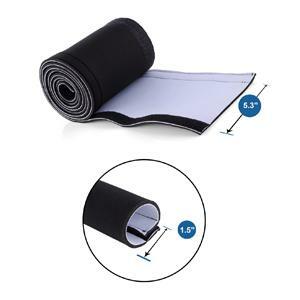 Made from neoprene stretchy material with strong hook & loop, not thin or flimsy, durable and easy to dust. Pretty roomy inside to fit up to 10 cables depending on the size of the cables. are optional to separate the cables.